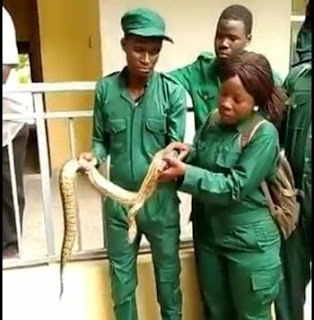 A twitter user shared a post about a Lecturer at the department of forestry and wildlife in university of Maiduguri Borno State conducting assessment test with snake and we thought it will be nice if we share the hilarious video with you. So you have to carry snake to get mark. What will you do if you find yourself in this situation? Would partake in the assessment test or forfeit it?